India has set itself an ambitious target by committing to reduce the energy intensity of its GDP by 20 to 25 per cent by 2020. The promise is entwined with outcome of the recent Cancun climate meet that marked a major shift in burden-sharing in climate mitigation, with developing nations committing to meet specified targets. To achieve this target, India has announced the Perform, Achieve and Trade (PAT) scheme under the National Mission for Enhanced Energy Efficiency (NMEEE) programme. Sectors that consume maximum energy will be assigned efficiency targets in April. The aim is to save 10 million tonnes of oil equivalent (mtoe) by 2014. NMEEE is a part of the National Action Plan on Climate Change (NAPCC) launched in June 2008. PAT is too soft on industry. Unlike the European Union Emissions Trading Scheme (EUETS) and similar schemes worldwide, the scheme does not target carbon emissions directly, and does not promote uniform best energy efficiency practices, said Sangeeta Bansal, a professor at the Centre for International Trade and Development at Jawaharlal Nehru University in Delhi. The scheme will cover eight most energy-guzzling sectors—thermal power, fertiliser, iron and steel, cement, pulp and paper, aluminium, chlor-alkali and textile. 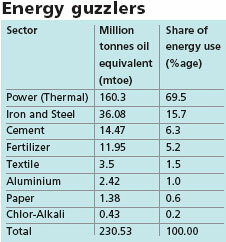 Together they account for 40 per cent of the nation’s primary energy consumption (see ‘Energy guzzlers’). In August last year, Parliament passed the amendment to incorporate PAT in the Energy Conservation Act. The power ministry announced on January 11 that electricity regulators in each state will ensure that defaulters are penalised. The state electricity regulatory commissions (SERCs) that came into existence after power sector reforms were brought about through the Electricity Act of 2003, have earned the reputation of efficient governance. “In each state, the designated agency will ensure compliance of the industrial units. Details of violators will be reported to the electricity regulatory commission,” said Ajay Mathur, director general of Bureau of Energy Efficiency (BEE), nodal agency for the purpose under the power ministry. Industrial units will be penalised Rs 10,00,000 for non-compliance and an additional fine of Rs 10,000 for each day of default. Over-achievers will get incentives in the form of energy saving certificates (ECSerts) which can be sold to industrial units that do not meet their targets. Prices of the ECSerts will be determined by the market. This trade mechanism will ensure energy efficiency in the eight sectors, said Mathur. PAT, thus, gives industries freedom to make up for their inefficiency by either spending on ECSerts or by investing in energy efficiency. By March 2014, BEE aims to reduce five per cent energy consumption in the eight sectors, or two per cent of the country’s existing total energy use. A total of 580 industrial units have been identified under the scheme. They will be assigned energy efficiency targets. Best performers will have to improve efficiency by 1.5 per cent. The target goes up to seven per cent as inefficiency increases. But the scheme raises many questions. 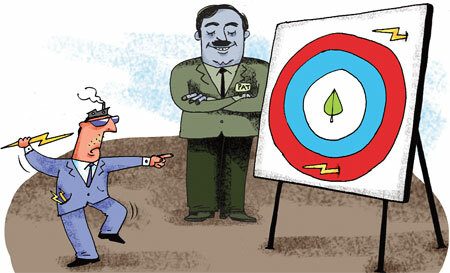 “Good performing industries will get low targets and poor performing industries will get high targets,” said Mathur. 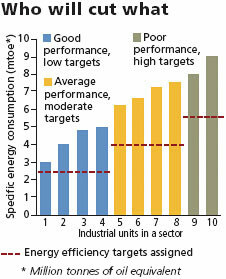 So, the targets will not result in uniform energy intensity within the sector (see ‘Who will cut what’). But will the scheme give adequate incentives to best energy efficiency practices? To start with, units that have already achieved high efficiency levels due to heavy investments will not be rewarded for their past efforts. This is the case especially in the cement sector where an industry representative lamented that many units are already approaching the international best practice levels. “They will have to strive beyond the 1.5 per cent target to generate any revenue from the sale of ECSerts,” he said. Poor performance of the largely state-run power sector is another problem. “Power sector alone consumes 70 per cent of the 230 mtoe used up by the eight target sectors combined. Most of the industries in the power sector are ailing state-run plants,” said an industry analyst. The poor performing state-run thermal power sector needs a regulatory framework and finances to meet the seven per cent target, he said. Some coal-based power plants have shown high rates of energy inefficiency because they are antiquated. Set up in the early 1960s, they have run their useful life. “The choice to shut them down for modernisation is not there because of chronic power supply shortage and paucity of funds,” said former Central Electricity Authority (CEA) chairperson Rakesh Nath. Last year, CEA recorded an average efficiency of old coal-based plants at 25 to 30 per cent, as compared to the best practice of 40 per cent. Similarly, units in iron and steel sector need sound investment. “One reason behind high energy consumption in steel industry is outdated technology,” said S K Jain, general manager at the Steel Authority of India Limited. In 2008, the specific energy consumption of crude steel was 6.9 Gega calories per tonne, 34 per cent higher than the global standard. “To achieve this standard, Asia-Pacific Partnership for Clean Development and Climate has suggested adoption of the energy efficient Best Available Technologies,” said Jain. But PAT does not address the inherent problem of complete revamping of outdated technology. The scheme does not advise a shift to cleaner processes to make the same product. Steel-making uses two popular processes—sponge iron and blast furnace. The latter has 40 per cent more efficiency potential. But PAT does not give any incentive for shifting from sponge iron to blast furnace process. NAPCC’s aim is to address climate change but no distinction has been made for units using cleaner fuels. The scheme takes into account the energy consumed and not the resulting carbon emissions. For example, one kilogramme of carbon dioxide is emitted during one unit of electricity generation through coal, compared to 0.55 kg carbon dioxide emission during one unit of power generation using natural gas. “It does not target greenhouse gas emissions directly and does not provide a level playing field to all industries,” said Bansal. So, units may not be able to claim ECSerts for using a low carbon— and expensive—fuel like natural gas. Discounting such high environmental benefits may harm long-term promotion of low carbon fuels. Financial returns on such investments would be calculated according to ECSert prices. But there is no mention of ascertaining its price in PAT. “Without a minimum price for ECSerts, investment in energy efficiency could turn risky. But not investing and hence being forced to buy ECSerts could be a greater risk,” said Joyashree Roy, head of the department of Economics at Jadavpur University, Kolkata. The EUETS, in operation since 2005, is being undermined because of lack of a minimum price. In the United Kingdom, a parliamentary committee stated a minimum price was needed for long-term investment. While being formulated, PAT evaded two big issues—setting uniform benchmarks and revamping inefficient and outdated units. It is time the government took difficult decisions at the policy level, much beyond the small window of PAT. While emphasis on energy efficiency measures in the select sectors is indeed welcome after such a long gap, they do reflect inherent weakness in addressing vital issues related to these industries. Technological transformation has been debated for over three decades and the author is right that this has been neglected in this exercise towards low carbon efforts. It would have been better had they focussed attention on every aspect of gain instead of half hearted beginning which may fail to fulfill the objectives. Thank you for your very insightful comment. We really need to overhaul the thinking process while designing critical policies. I think the important is to check how the mechanism can be reviwed and updated to learn from the potential flaws presented in the article and the real flows that will appear once the scheme is operational. Anyway europeans have taken years to improve the ETS since it was first designed and still the phase III is not fully agreed upon. Lessons from the white certificate scheme in which utilities and not final consumers are the ones with energy efficency obligations can be also an option. What could be interesting is to have a uniform platform for trading credits from various platforms! Like REC and ECSerts. The government should come up with a pan sectors, industries, unified, national trading platform, like the EUETS. Rather than every ministry coming up with their own national missions and their own climate change policy, why not have a consortium that will bring a lot of ease and clarity to the markets just like what direct tax code proposes to do in taxation. Thanks for the comment. I think we need to tread carefully while discussing harmonisation of REC and PAT markets. The major issue is that power generators who have, say earned PAT certificates, can also sell them as RE Certficates. This may lead to double counting which is not preferred. On the other hand, using RE certificates for PAT compliance can be a good move, but disincentivise energy efficiency measures inhouse in industries. So there needs to be certain degree of caution and introspection before talking of harmonisation. Nonetheless, the idea stated is a possible option. And of course, different ministries having different schemes certainly leads to confusion. Very good article highlighting the lapses in the draft policy.Still lot of ambiguity persists over this scheme,regarding the approaches like Gate to Gate approach in fixing of the boundaries to DCs as well as in computation of MTOE etc...For example from the understanding we have so far, for the plant utilising the power from it's own CPP,the MTOE calculation is based on "Units Consumed X CPP Heat rate", where as the same would be "Units Consumed X 860 Kcal" for the plant using the Power from Grid. This approach leads to huge differences. With the targetted date of implementation nearing,there is a lot of discussion still going on over this scheme. Insightful read... i'm not yet entirely aware in details regards the many aspects of environmental/climate change but sure am interested in knowing more. Keep up the good work Uma and many thanks for keeping us updated. a Verification of Data submitted by DCs. c Develop Process Flow Diagram and define sub processes. d Develop Energy Balance Diagram of each sub-process. The minimum time duration of 10 days is given for completing baseline energy audit report for Iron & Steel Sector on Page 9 of RFP while on Page 10 under Clause 5.0 Timeline the time period for completing the Baseline Energy Audit is 6 months, which is contradictory. What's more, it also states that priority industry audit is to be completed before 31st Mar 2011, clearly showing an ill-conceived and hurriedly called RFP. The above scope of work is next to impossible to complete due diligently, unless EESL & BEE are looking for an "EyeWash Audit" for an iron or steel plant that too a massive integrated steel plant since such steel plants are designated consumers with minimum cut off level of 10 mmtoe in period of 10 days. Furthermore, the RFP also states that if the actual period exceeds the minimum number of days, no extra payment will be made. I do not have the corrigendum/common set of deviations issued later on. However, the FAQs also clearly shows that nobody read between the lines or if they have read they have cunningly avoided asking the question i posted so that they can later on manage for extension of time, rate revision and so on and so forth. What's more this RFP was prepared by an agency hired by EESL by paying them few lakhs of rupees to dole out such a scrap material. PAT scheme is bound to fail.Under the scheme if at all implemented, already efficient units may finally end up paying to energy inefficient ones as it is much easier to improve the efficiency at lower level than at higher level. Another scenario-If all the units manage to improve then who will buy the certificates? Will the government buy them? What is the mechanism for penalty provisions? Where is the Bench for hearing of such cases? Dear Mr. Sood and Mr. Many thanks for the insightful comments. As you have commented, the clarity on the implementation of PAT scheme is missing, especially on how it will pan out. We will continue to update on the developments of PAT from BEE.